How would you improve Britain’s roads to make them safer for cyclists? There’s little doubt that improvements need to be made to Britain’s road network to safely accommodate cyclists next to cars, vans, lorries and other users. However, actually coming up with a workable solution is not an easy one. Many of Britain’s roads were not originally designed to take heavy traffic, and certainly not designed with enough space for segregated lanes for motorised and non-motorised vehicles. Below is a selection of the answers we received. If you have your own idea, let us know in the comments section below. We have to change the mindset that says the car/lorry/bus is king. At the moment we send pedestrians on long walks so the cars don’t have to stop. People walking in the rain and snow make way for people sitting in the warm, dry cars. If this was to happen, drivers would be less impatient, maybe less aggressive and take other road users into account. Wipe from the face of the earth shared pavements and cycle paths/routes which are not fit for cycling on at a reasonable pace. Get rid of width restrictions and chicanes. 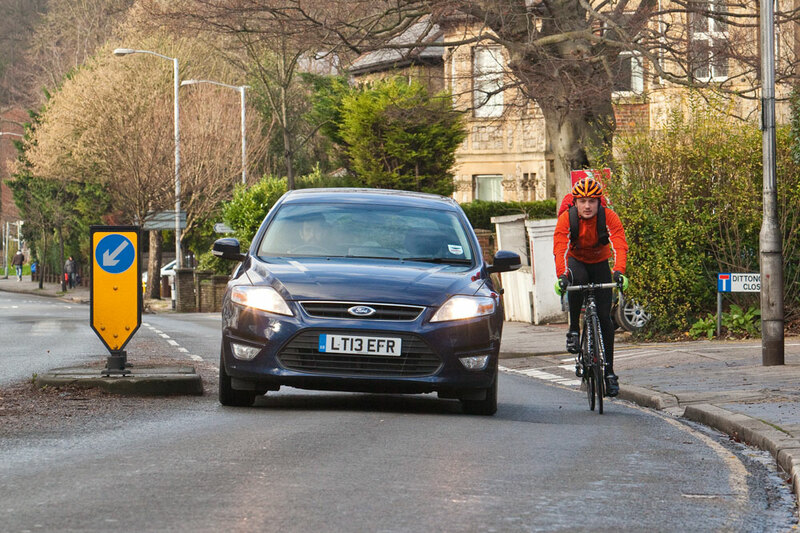 Teach cyclists to ride in primary position and stay off the pavement. Enforce both. Follow Dutch town planning practices and put cycling and roadcraft on the school ‘citizenship’ curriculum. Riding the roads of County Durham and environs is currently like undertaking the Arenberg Trench every day. The road surface is loose and broken and covered in potholes. Constantly having to swerve around major hazards in the road makes it difficult or impossible to maintain a safe position. Safe roads means properly maintained roads. Give cyclists and pedestrians right of way over cars at junctions. That’s how it works in Germany. For example, when turning from a main road into a side street, cars have to stop and allow cyclists and pedestrians to cross before continuing. Yes, even if this holds up all of the traffic! In my experience, awareness of, and respect for, the rights of other road users is generally much higher in Germany. Everyone in the country can go and buy a bike with half of it paid for by the government. Less cars on the road means it will be safer for cyclists, the country gets fitter with more people riding their bike just to go to the shops instead of driving. Less fat people, less of a burden on the NHS, and we will have a much happier country. Automatic retesting must be introduced for an ever-ageing population. A proportion of elderly drivers have failing health issues that affect their ability to drive safely. They are perhaps not aware of their problem. I would say the driving ability of elderly drivers is worse that the youngsters who are generally perceived to be the problem. More rigorous enforcement of current road laws. How many times do you see cars with only one headlight or taillight working, speeding, badly parked, not indicating, jumping lights, blocking junctions, etc? Also cyclists on pavements or riding the wrong way up one-way streets. Get the idiots off the road and make it safer for everybody else. More cross-country cycle networks avoiding the busy roads making rides safe and scenic. I think that drivers of mechanically-propelled vehicles view cyclists as a hindrance on the roads, rather than an equal. So drivers attitudes need to change and that can only come by changing the driving test to include awareness of cyclists using the roads as well as other vehicles. Ditch bike lanes. They have sub-standard surfaces, always covered in crap, never cleaned, never salted and gives ignorant drivers excuses to punish pass.